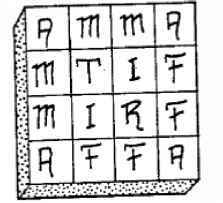 These Symbols (i.e., Magick Squares), then, be made for you to avail yourself of them when you be in the company of other persons; also you must have them upon you, so that in touching or handling them simply, they may represent your wish. Immediately then he unto whom the Symbol appertaineth will serve you punctually. The theory of Magick Squares is a very old one. Their use stems from the principle of the power of words to name things, and that knowing the name of something gives you a degree of power or control over it. Refer to The Sacred Magic of Abramelin the Mage translated by Mathers for the theory and use of Magick Squares. Enochian Magick also includes Magick Squares. They can be used as aids in meditation or as talismans. 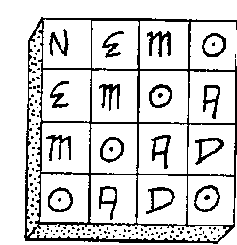 Five of the most important of these squares are presented below. 12 which reduces to 3, "the son or sum of one" (the supernal father) and "two" (the supernal mother). This is the square of NEMO, the Magister Templi or Master of the Temple. bodies the idea of the inherent limitation and mortality of matter and of all physical existence. It should be used carefully. reduces 524 to 2, the number for "Divine Will." ROR is the Enochian word for "the sun" and ODO means "to open." The name of the Egyptian solar god, Ptah, means "the Opener" and this Magick Square expresses the same creative forces that are associated with Ptah This square embodies the forces of the solar current.